Northern Manitoba may be scenically spectacular, but what I also discovered is that the people of Thompson are truly remarkable. When I briefly visited late July, they embraced me with open arms like a long lost friend and invited me along on a wonderfully thoughtful tour, sharing with me their love and passion for the city they’re proud to call home. I was truly taken aback by their generosity and kindness. It’s a shame that Thompson is so often undermined as a tourist attraction, but believe me, it’s far beyond a mining town. I learned that there’s a lot going on for Thompson if you’re willing to give it a chance. So with that in mind, here are my top five things to do, based on my personal experiences this summer in what’s one of Manitoba’s most underrated destinations. When you’re first learning about the destination you’re visiting, I always like to start at the very beginning with its history. I instantly fell in love with the Heritage North Museum as soon as I stepped through the doors. 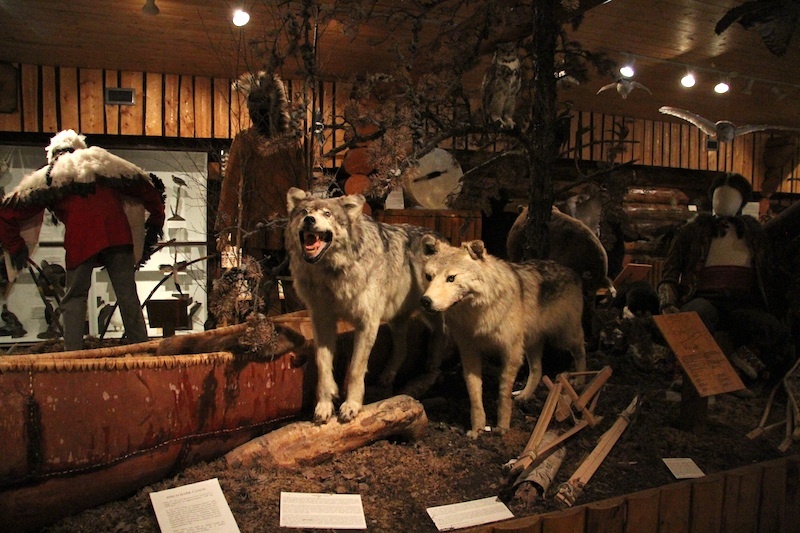 Incorporated in 1990, the Heritage North Museum tells the story of Thompson’s natural history, its indigenous Cree culture, as well as how the City of Thompson came to be. I didn’t fully appreciate, for example, that nickel was discovered in the area as recently as 1956, and because of that, Thompson was purposely built as a community for INCO, the local nickel mine. 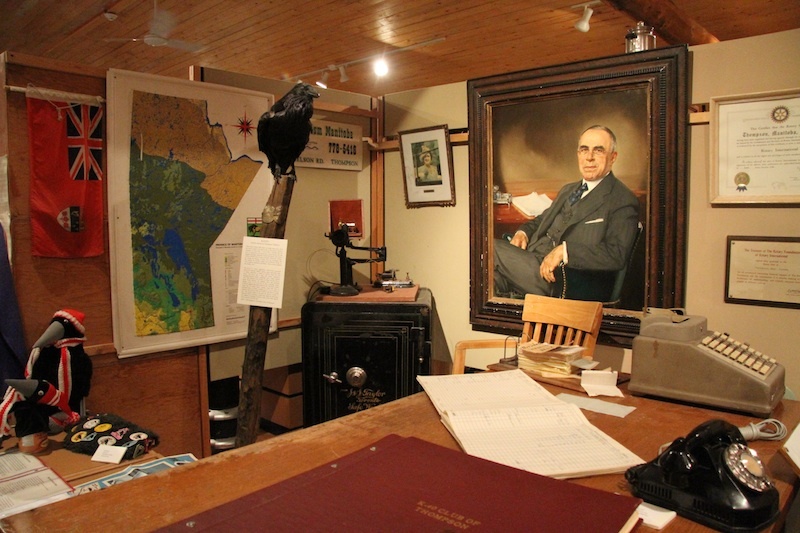 The museum is very much about the people who shaped Thompson as it is about its environment. It’s packed with fascinating exhibits and is displayed in a thoughtful manner. 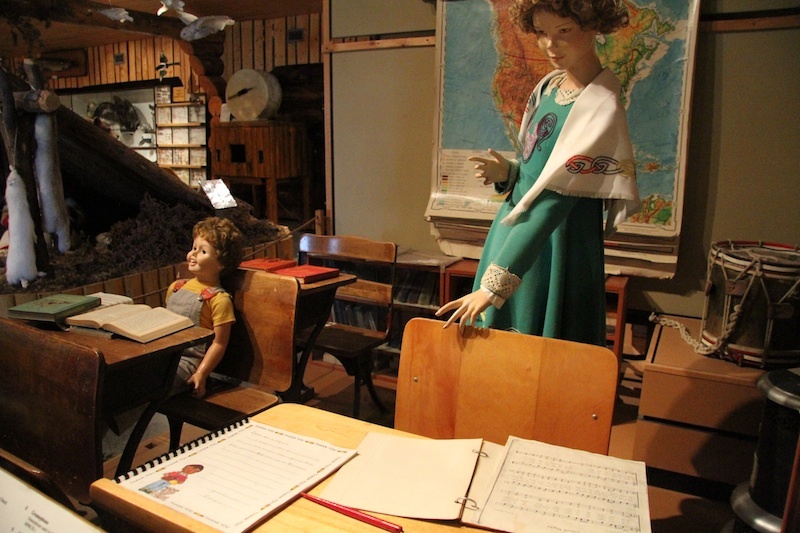 My museum interpreter, Doreen, was a treasure trove of factual information and anecdotes. 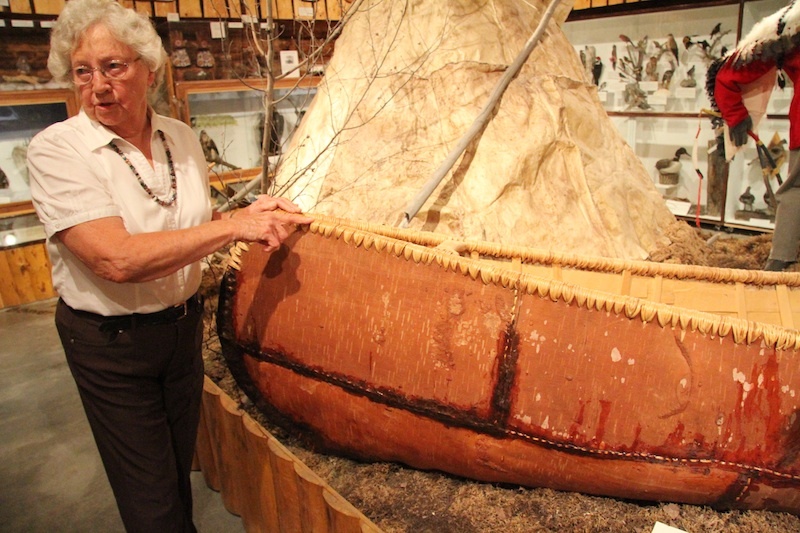 Of course, naturally, she’s a retired school teacher who used to teach in Thompson, with some of her own students’ school work now a part of the exhibits. Also be sure to check out the gift shop as they sell a lot of beautiful local artwork. Spirit Way is quite possibly the best way to experience Thompson while on foot. 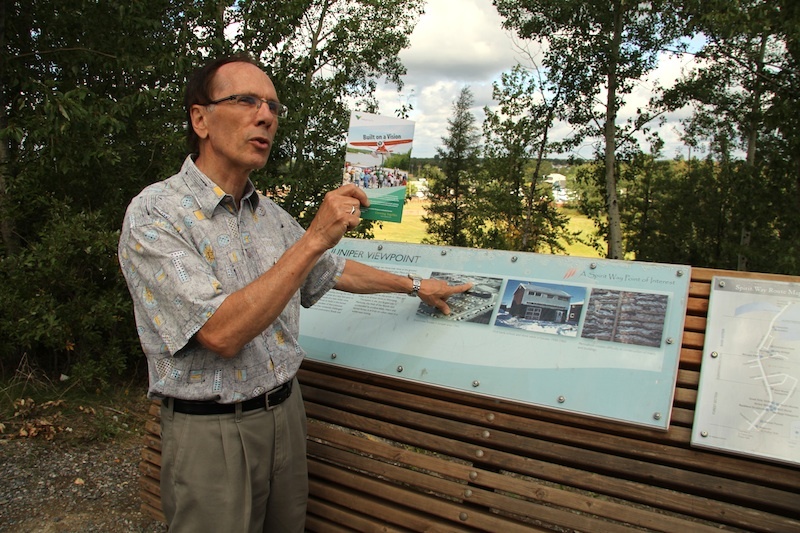 Consisting of a 2.5km self-guided walking and biking trail, Spirit Trail takes you from the North Heritage Museum and leads you to 16 points of interest along to way, ending up at the Miles Hart Bridge. To walk along and experience the entirety of Spirit Way normally takes 2-3 hours. While I only visited several of points of interest, all of them offer either a scenic viewpoint or a cultural point of interest, such as a statue, a memorial, or a piece of artwork. All of them have in-depth information, offering various perspectives on the point of interest. I found it a fun and immersive way of getting to know Thompson while enjoying the fresh air and the natural surroundings. 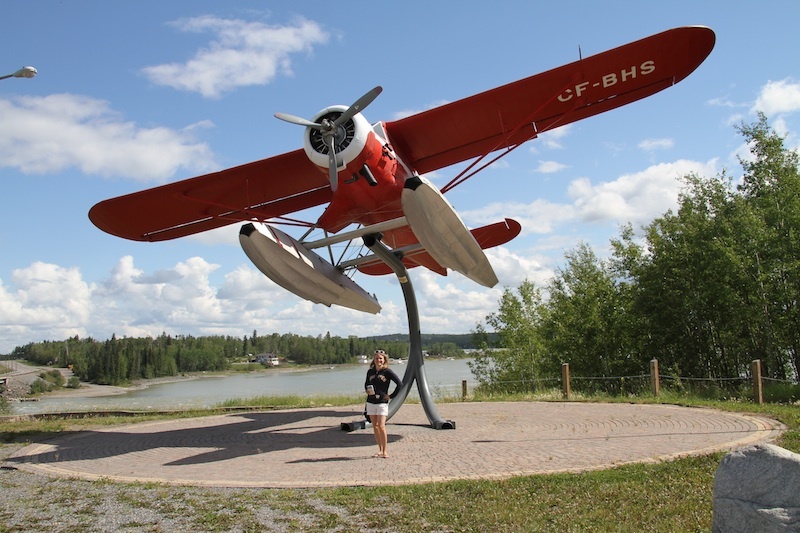 Some of my most memorable stops along the way include the Robert Bateman wolf mural viewpoint (which is the largest photo-real mural in Canada! 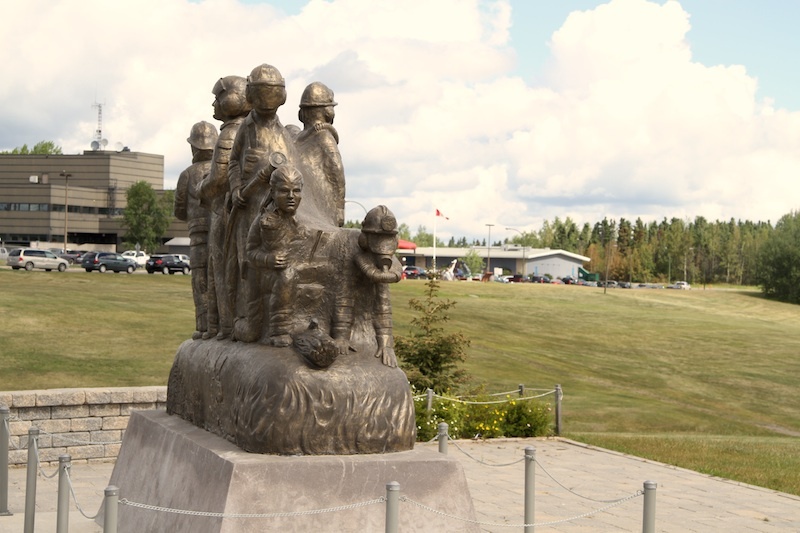 ), the stroll though the Boreal forest, and the monument to Northern Firefighters and rescue personnel. I should also mention that I truly lucked out during my visit because I got a tour from local ambassador Volker Beckmann, whose charisma and passion for Thompson is infectious. 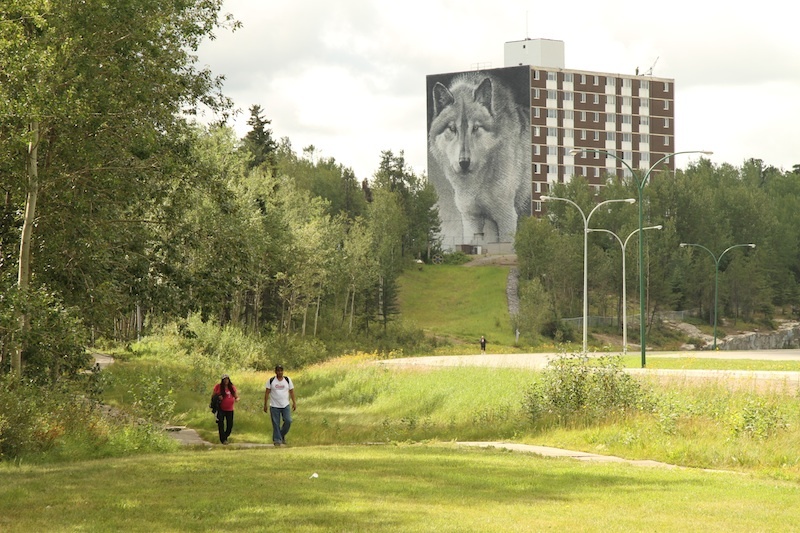 His stories about how Thompson secured the Wolf Mural is amazing, and he really brought to life every stop of Spirit Way. Although there are currently no organized tours (yet), there’s plenty of information at each stop, although you can can always purchase an Official Spirit Way Guide Book to provide you with even more. 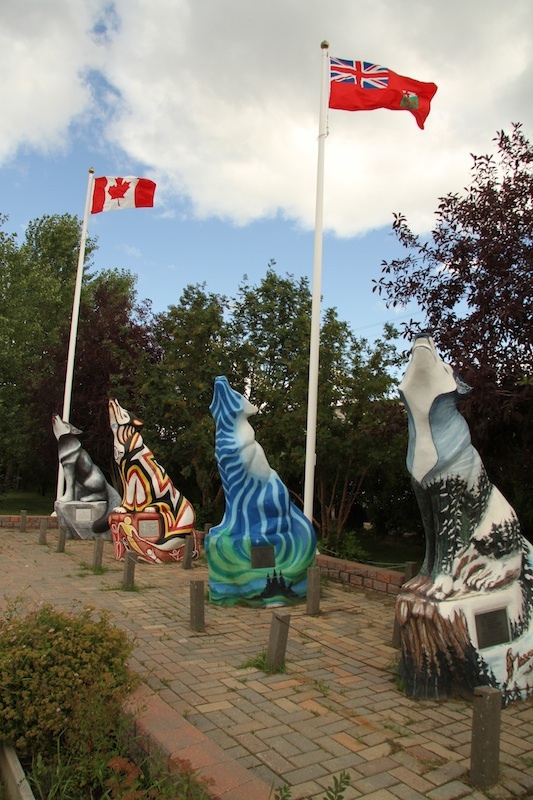 There are 49 whimsical concrete wolf statues in Winnipeg, Churchill, and Thompson, and 35 of them are located in Thompson alone! Most, if not all of them, are located along the Spirit Way, hence “Wolves Along The Way“. What’s really cool is that if you’re into geocaching or if you have a GPS, you can follow along on a “GPS wolf hunt” with the goal of tracking down the mystery title of each. All you have to do is buy a GPS Wolf Passport and then find the titles of all 49 wolf statues to become the GPS Wolf Tracker Master! For people visiting all three cities, this is a must! 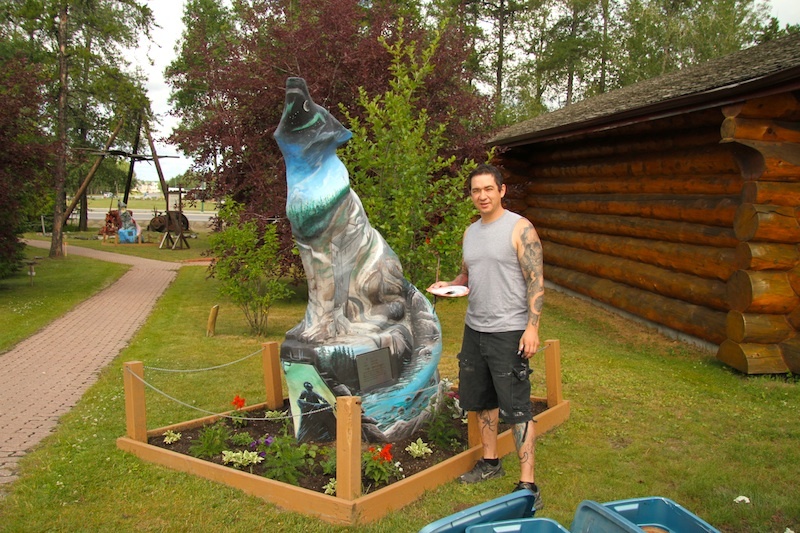 Each wolf statue has its own story and is sponsored, and then painted by an artist. Often there’s a story behind the painting. For example, one of the wolves at the Heritage North Museum was painted with a floral motif. It was pretty, but didn’t stand out in my mind, until I discovered that the wolf was sponsored by an elderly man who used to volunteer at the museum. His wife used to grow beautiful flower gardens, and when she died, he sponsored a wolf in her memory, and planted flowers around the wolf in her honour. Now that he has died, the staff at the museum tend to his flowers in both their memories. Coincidentally, local painter Jasyn Lucas was just so happened to be touching up the paint on his wolf when I visited. Jasyn’s an extremely talented local painter whose canvas painting of the Northern Lights was given to me as a gift by the staff at Tourism North earlier in the morning. His artwork’s also for sale at the museum. 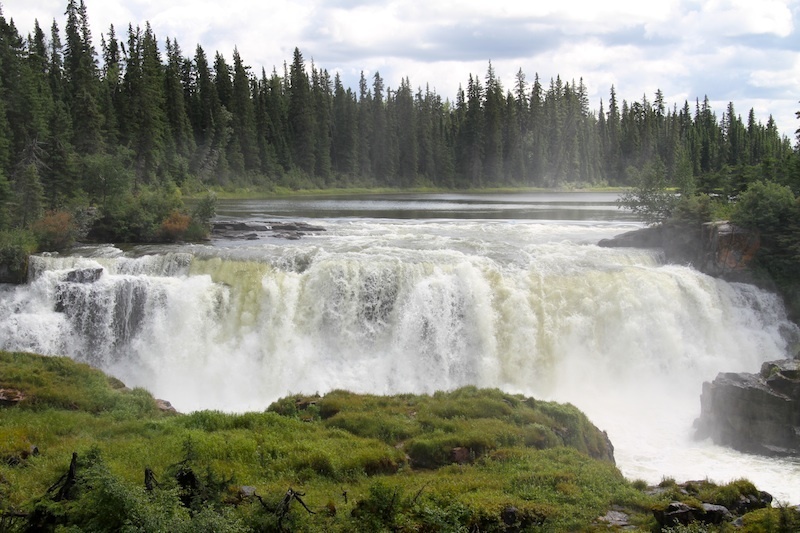 When I first laid eyes on Pisew Falls, I thought I had transported myself to the Rockies. Located an hour’s drive south of Thompson, the waterfall was roaring and was unlike anything I had ever expected to see in Manitoba. Surrounded by lush forest, the greenery was also an unexpected treat. Although many come here for elaborate hikes, you can take the boardwalk trail to the front of the falls to admire their beauty. 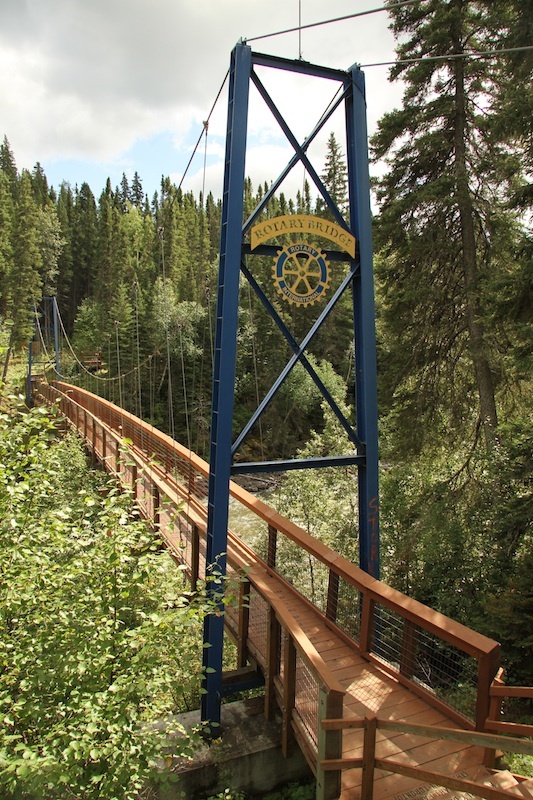 There’s also a short trail that takes you over a suspension bridge to a lookout point behind the falls. This is an absolute must for nature lovers. 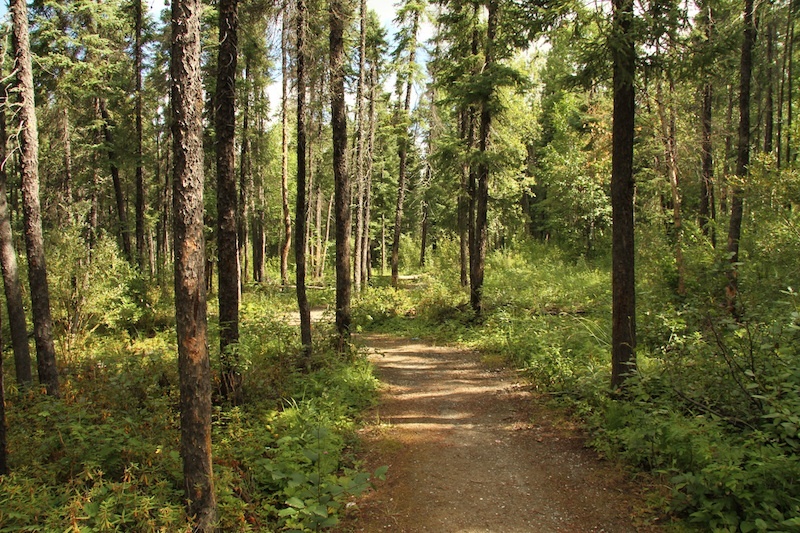 Located a 35 minute drive south of Thompson is Paint Lake Provincial Park. Though my time there was fleeting, I got to experience Paint Lake for about an hour via Sea-doo – my first time sea-dooing. Apparently I only saw a small part of the lake during my hour – it’s that big. It was Marion Morberg, the President of Spirit Way Inc. who invited me into her home and took me out on this exhilarating journey. She first gave me a second pair of pants, a toque, a waterproof jacket, and gloves to wear. It felt ridiculous, but out on the water, it made sense. 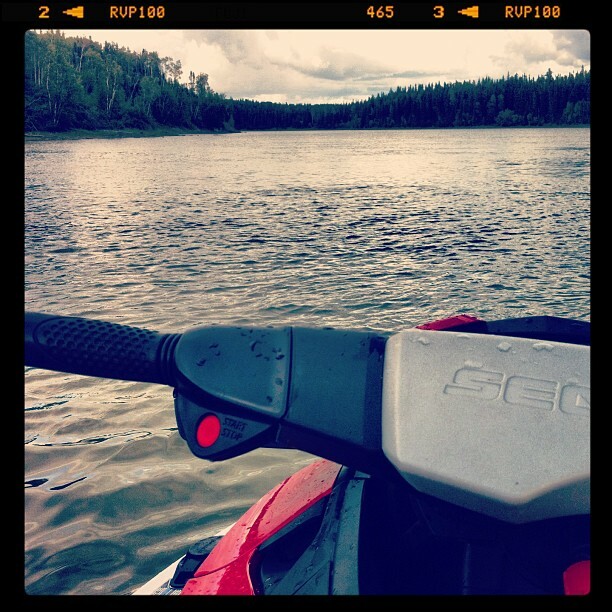 At times we were flying 50 miles an hour over the vast lake… it’s like riding a motorcycle, but on water! We braved a downpour for part of our journey, but part way through the sun came out, and with it rainbows. All the while, there were eagles and waterfowl and the magnificence of nature all around us. I can only imagine what it could be like to go camping here! I might have only spent one night in Thompson, but the people and the place left a mark on me. 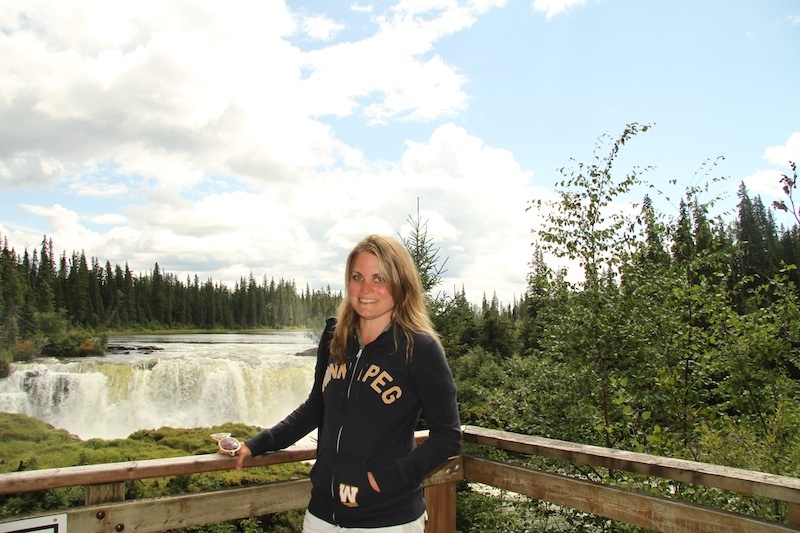 A visit to Thompson will change the way you perceive the north, and may expand your preconceived notions of Manitoba as a province. I know it had that effect on me. A big thank you to Volker, Marion, Colleen, Tanna, Doreen, and everyone whom I met during my time in Thompson. My Jasyn Lucas painting is a constant reminder of my wonderful day exploring Thompson with all of you. It was a pleasure to meet Robyn. All volunteers at Spirit Way Inc try to reflect our love of living in the North. There are so many fascinating things to see and experience if the traveler takes the time. We pride ourselves that this is not “canned” tourism. It’s real life in an urban centre surrounded by rugged, beautiful wilderness and friendly residents. born and raised in Thompson. Will always be my home no matter where I find myself living. This was/is a wonderful complement to Thompson. I spent 10 years in Thompson back in the 70’s and remember it fondly. I was fortunate to visit Thompson back in June/2013 but did not do some of the top 5 things Robyn did but will definitely consider them on my next trip!! Handy tips!! I will be going to Thompson next month and got about nine to ten hours to kill between arriving on the Greyhound and the departure of the train. I won’t have a car so the falls and jetskis can’t be reached, but I’ll make sure to do the Spirit Way and visit the museum. Hope you enjoyed the Netherlands (where I’m from, ha)!